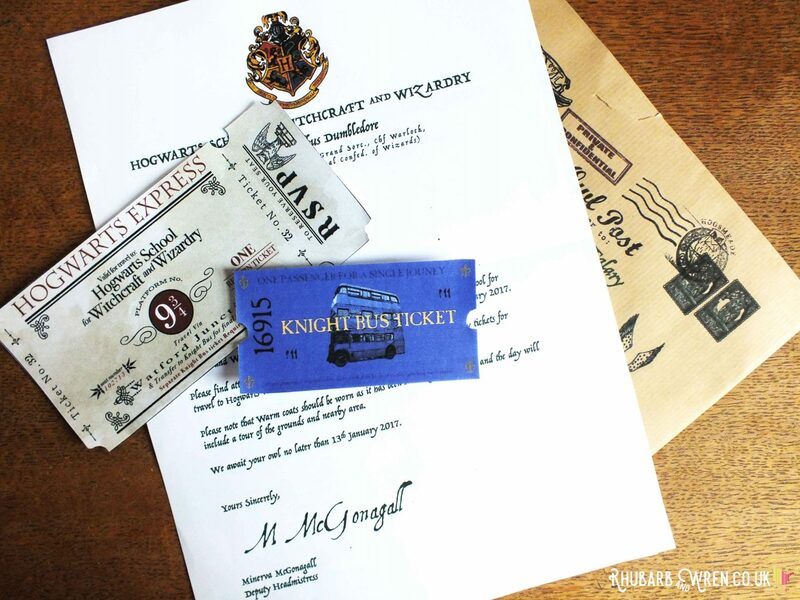 Surely every Potter-head child dreams of getting a letter from Hogwarts? Yes, it’s a letter from Hogwarts just like the one Harry receives at the beginning of ‘The Philosopher’s Stone’. Not the most original idea, but the kids loved receiving these so why mess with a classic! I did however take a few liberties with the text since our guys, at seven, are too young to officially start at Hogwarts… so their letters instead were to offer them a place at the “Hogwarts Open Day for Prospective Students”, which included, of course, a tour of the school and grounds. Along with the letter were complementary travel tickets (Hogwarts Express to Watford Junction, then the Knightbus to the Studio/Hogwarts itself). Also in with their letters was an itinerary of the day, to give the other parents an idea on timings. I put together the letters and contents using photoshop and various images and templates found online – see the links list for my sources! Since I’m a terrible knitter, I took the easy route and bought a couple of cheap Hogwarts-esque scarves from Amazon. After wrapping them in brown paper (thank you, Amazon packaging) and string, I stuck on a Madam Malkin’s Robes for All Occasions label, along with a ‘Hogwarts School Scarf – Gryffindor’ tag. These weren’t actually in their Harry Potter party bag. The boys got these before we went and were absolutely thrilled – they wore them pretty much all day! (affiliate link) ​Striped Scarf from Amazon – this one is dirt cheap and comes in all of the different house colours! (affiliate link)Hogwarts school tie – also dirt cheap and in all of the house colours too! (affiliate link)Hogwarts embroidered patches – iron on, and in a huge range of choices, including the different Hogwarts houses but also things like the Triwizard Tournament and the Order of the Phoenix or Deatheaters… whichever rocks their boat! 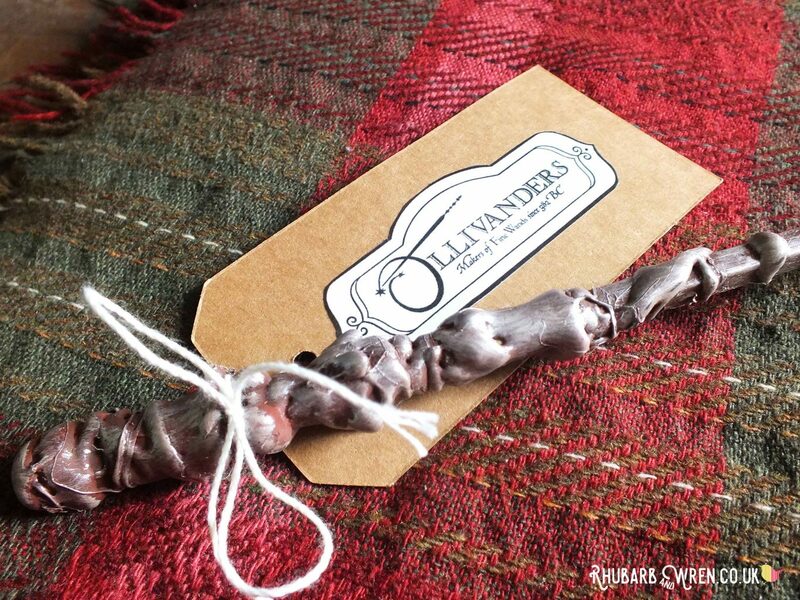 Just like Harry’s, home-made wands are one-of-a-kind! 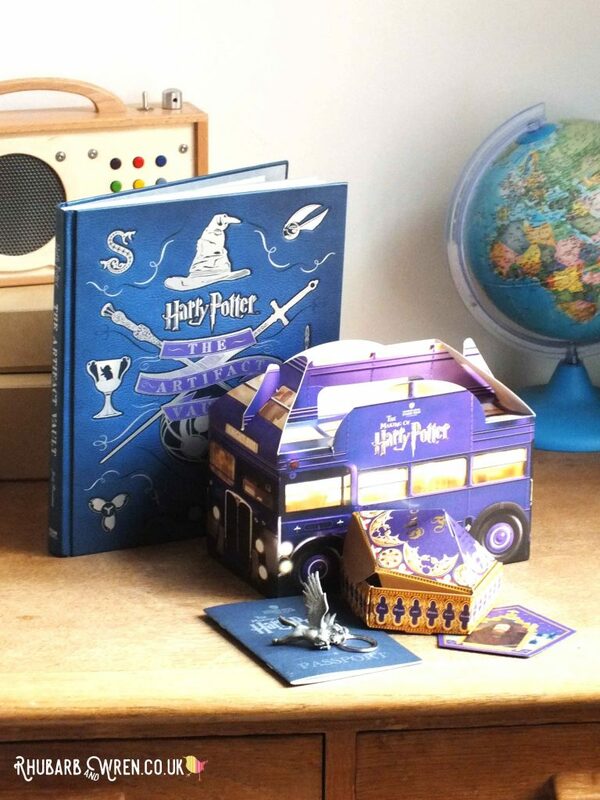 Numero Uno on any Potter fan’s wishlist. Of course they had to have wands in their Harry Potter party bag, and as the wands at the tour were ridiculously expensive (£29 each! ), I decided to try out the ubiquitous chopstick/glue gun tutorials that are all over Pinterest. For once, it really was that easy, and the wands look (in my humble opinion) amazing! Since I already had a glue gun, chopsticks and paint, they were also effectively free. The boys LOVED their wands, and they were quick, easy and fun to make. Since this outing, I’ve made a few more of these wands using twigs instead of chopsticks, which I MUCH prefer. You can read my detailed tutorial for these wands here. The only thing I would add is that if you do decide to use chopsticks then for my kids – aged seven – normal sized chopsticks were just the right length. I didn’t bother to get the longer chopsticks (used for cooking) that many of the instructions out there describe, so if you can’t get hold of these, don’t stress. In fact you don’t even need chopsticks at all – a sturdy twig from the garden works even better and gives you lovely, unique texture and shape to work with. I didn’t make boxes (how much time do these people have?! ), but found that the seven-year old boys were perfectly happy with their ‘Ollivanders’ tag. They did both get a kick out of the reverse side of the tag which told them the wood type, core material and length of their particular wand, so I recommend at least adding this detail. You can find information about different wand woods on the Pottermore site here, and on the Harry Potter Wiki site here, while different wand cores are described on Pottermore here, and the Harry Potter wiki pages here. An Ollivanders label in lieu of box! Label your wand with wood and core! 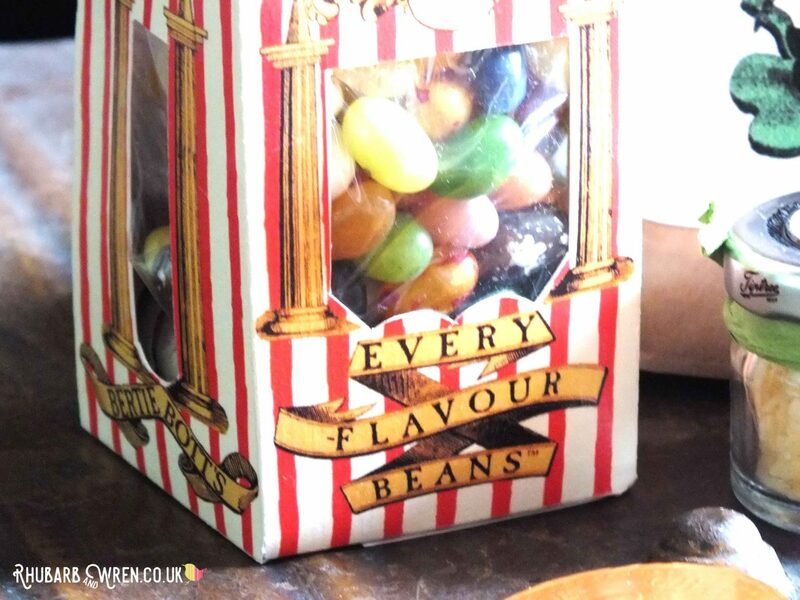 Print out your own Bertie Botts Beans box and fill with jelly beans. 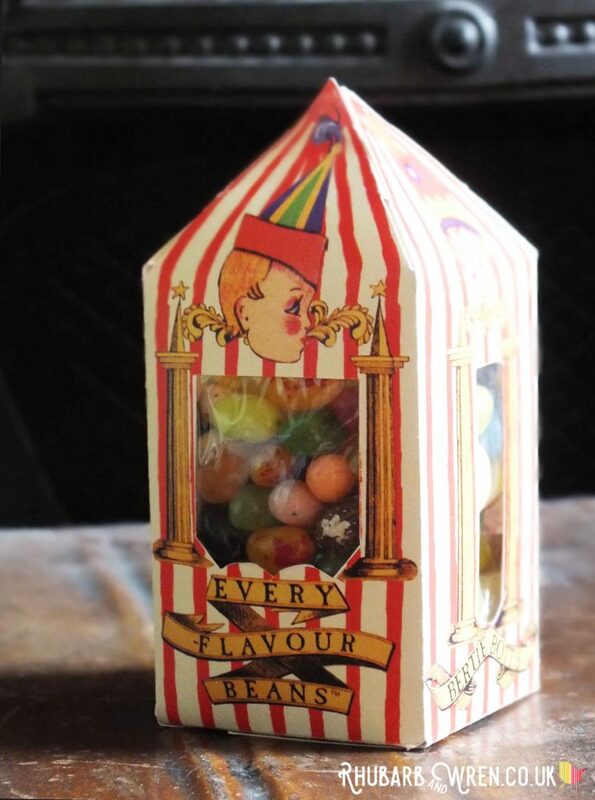 Now I would happily have shelled out for the kids to get some Bertie Botts Every Flavour Beans at the shop, but had a minor heart attack when I found out they (along with the chocolate frog) were £9 a box. £18 for the two boys to have jelly beans was a tad too much for me. There are lots of places online where you can find the template for boxes – this one looked so good once printed, cut and folded, that the boys had no idea they weren’t ones from the shop. I got K-Dog to print it out on thin card using the office laser printer (ahem), which made a big difference. The box is very easy to fold up, and once done, I just popped a clear cellophane bag full of (affiliate link) Gourmet Jelly Beans (bought bargainously cheaply at TK Maxx) inside. I also mixed in a little pack of their (affiliate link) Bean Boozled range, which have suitably disgusting flavours. This looked really fabulous as part of the Harry Potter party bag. The essential Potter Party food! 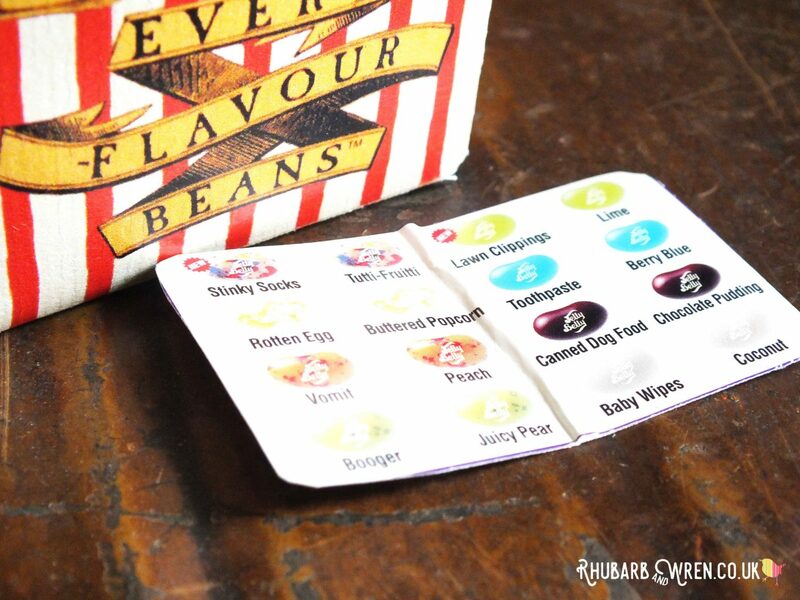 Add some Bean Boozled flavours for grossness! 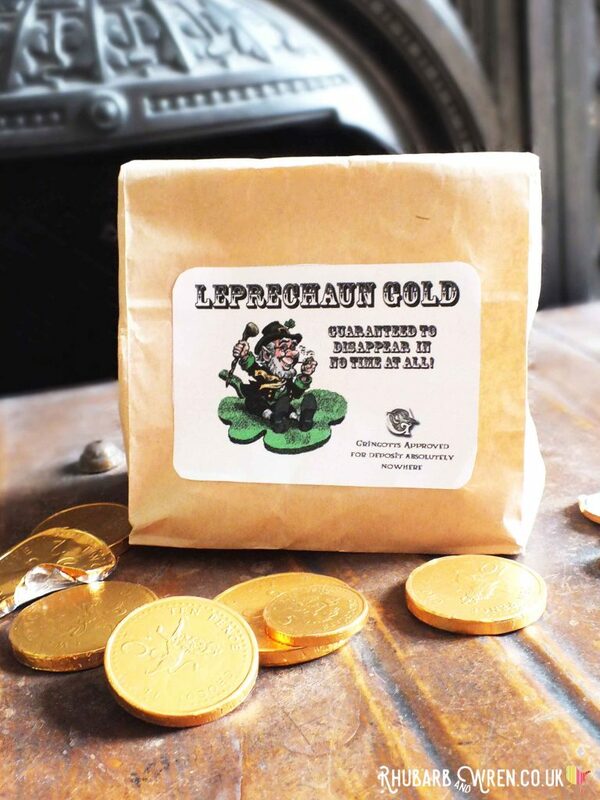 Leprechaun Gold Coins and Edible Portkey Powder for yummy Potter treats. 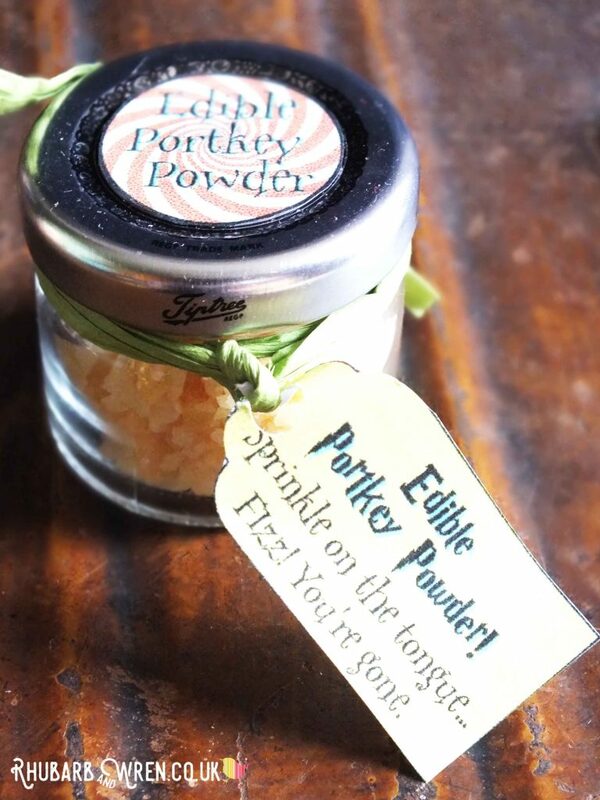 Popping candy for Portkey (or Floo) Powder. 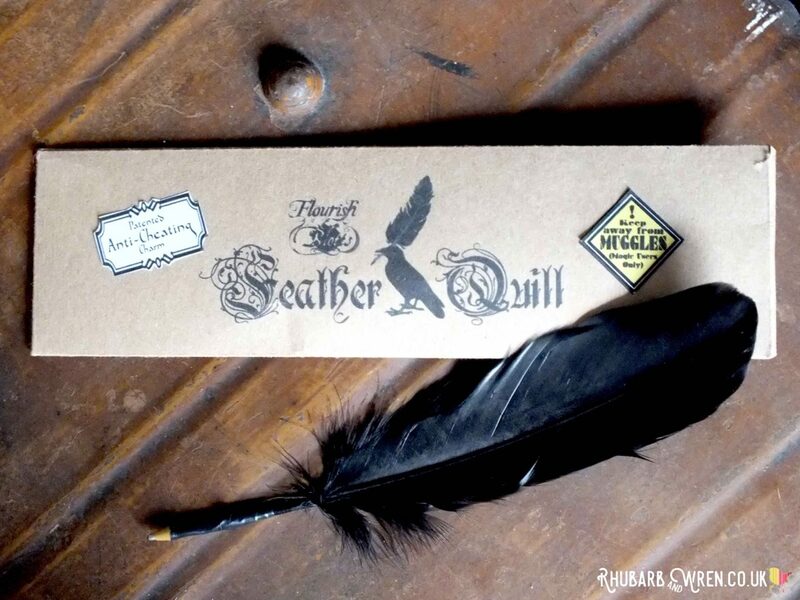 You can’t go to school without writing equipment, so I included a feather quill each too, in a homemade envelope. I whipped up the quills in literally minutes, using the tried and tested technique of taking the middle out of a biro (this sort work best), chopping the end off to make it shorter, then cutting the tip off the feather and inserting it. A bit of black electrical tape and you’re done. We used to make these as kids, and I was pleased to see my old skills hadn’t rusted up too much! 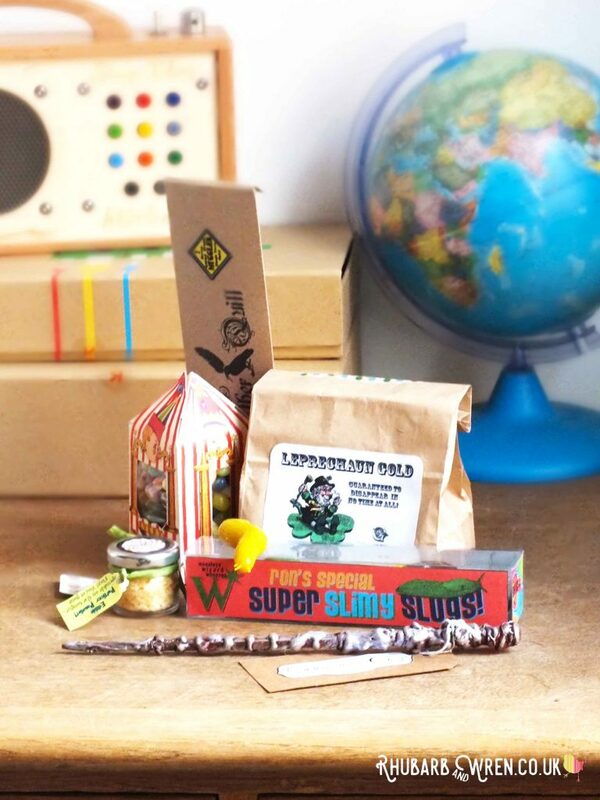 These made a very quick and easy addition to the Harry Potter party bag, but the boys were suitably impressed! (affiliate link) Craft Feathers – any large goose, ostrich or peacock feathers work well. G-Man’s favourite characters are Fred and George Weasley (no, he doesn’t know – we haven’t finished the books yet! 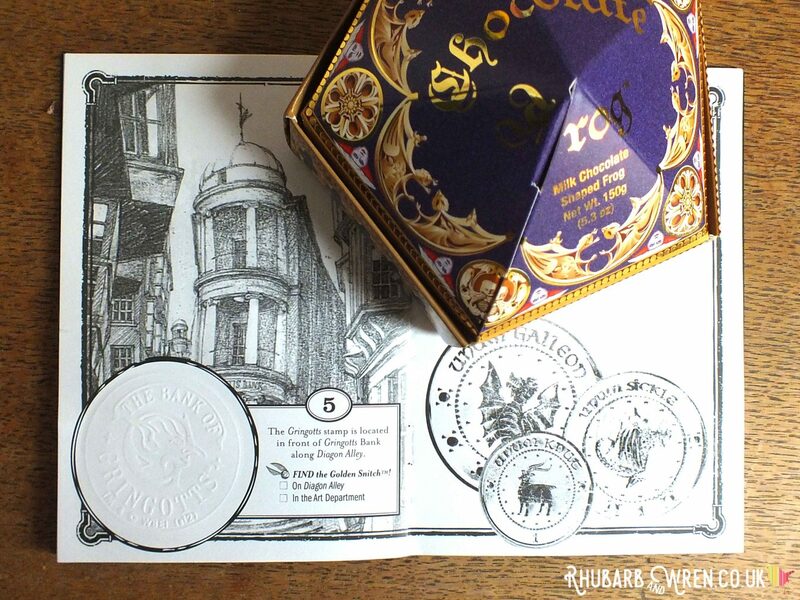 ), so I wanted to include something from Weasley’s Wizard Wheezes in their Harry Potter party bag. They had lots of brilliantly packaged stuff (Decoy Detonators, Extendable Ears…) in the tour shop, but it started at around £15 so would have been too pricy to get them both something. 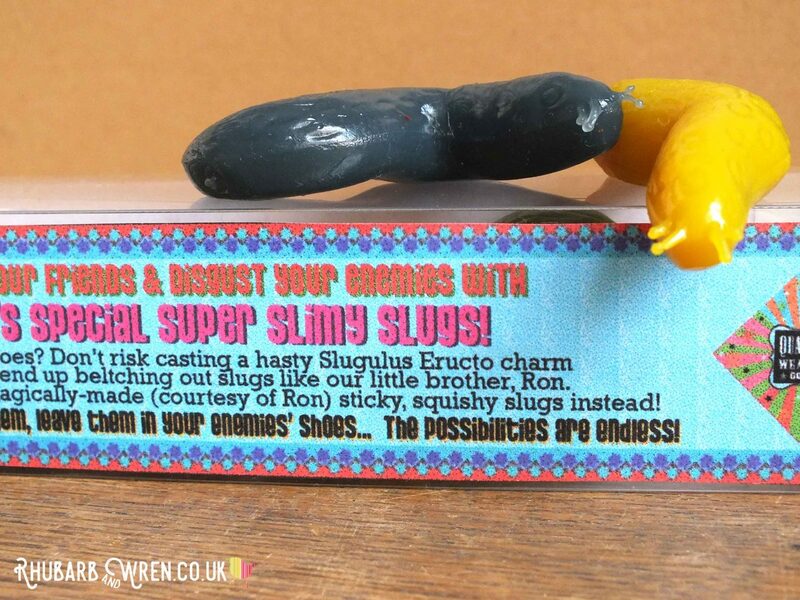 Magic slimy slugs, courtesy of Ron Weasley. 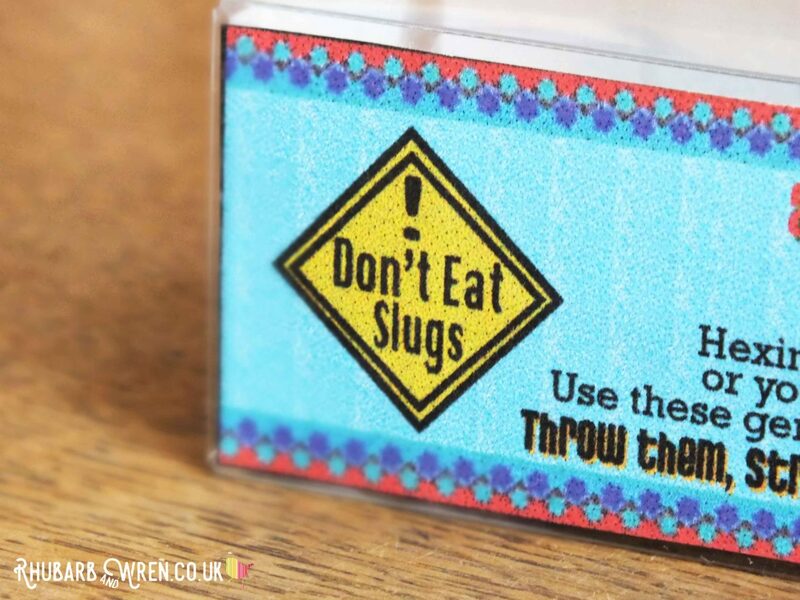 Whatever you do, don’t eat slugs! Instead, as there are lots of box templates on the web, I looked around for magic tricks or practical jokes I could repackage. 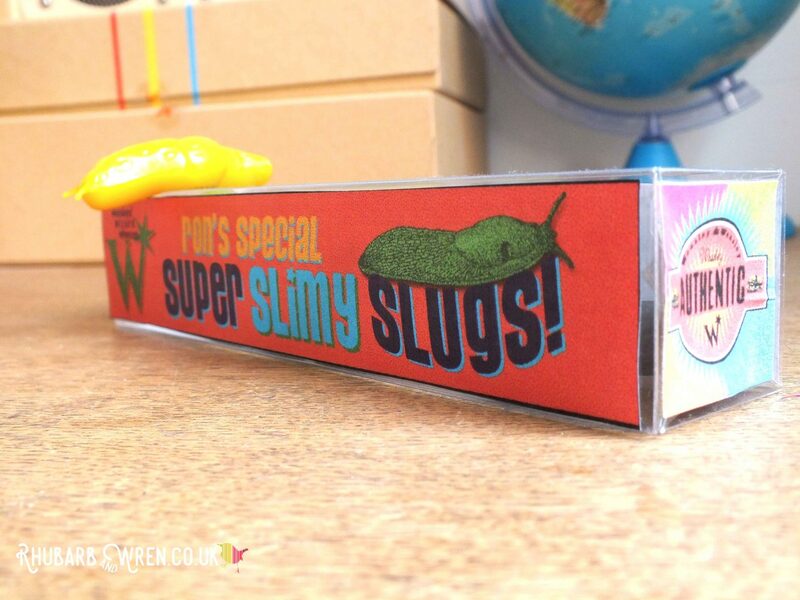 In the end, I went with these disgusting slimy slugs (I found a big box cheap in the sales) that reminded me of Ron’s backfired attempt to curse Malfoy, and just put together my own labels using some of the online Weasley branding. The boxes were just random ones I found in our junk modelling supplies. 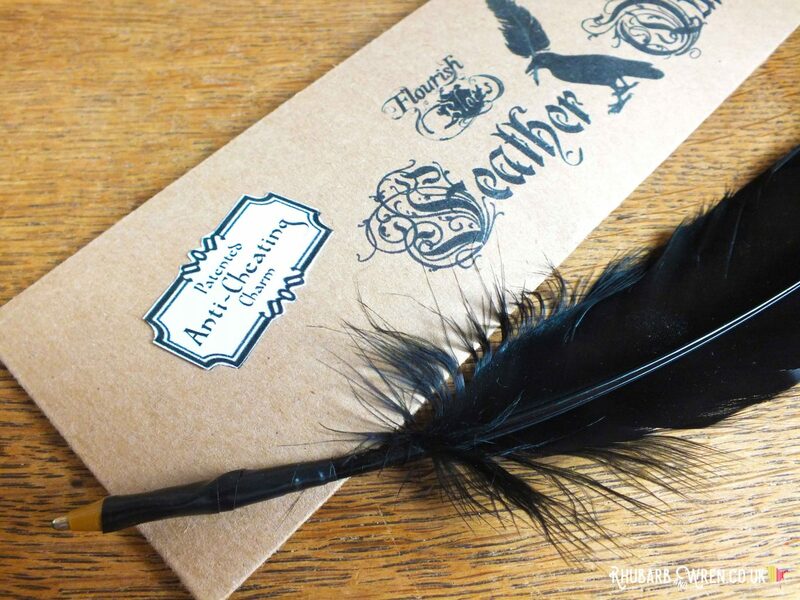 These were one of the big hits of the Harry Potter party bag! 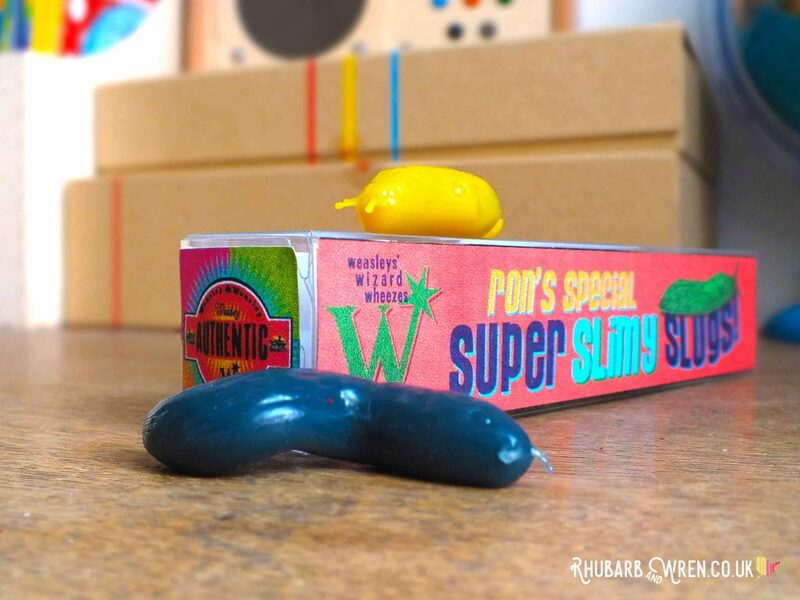 Ron Weasley’s special and super slimy slugs as packaged and sold by Weasleys’ Wizard Wheezes – Hogwarts students (and teachers) beware! 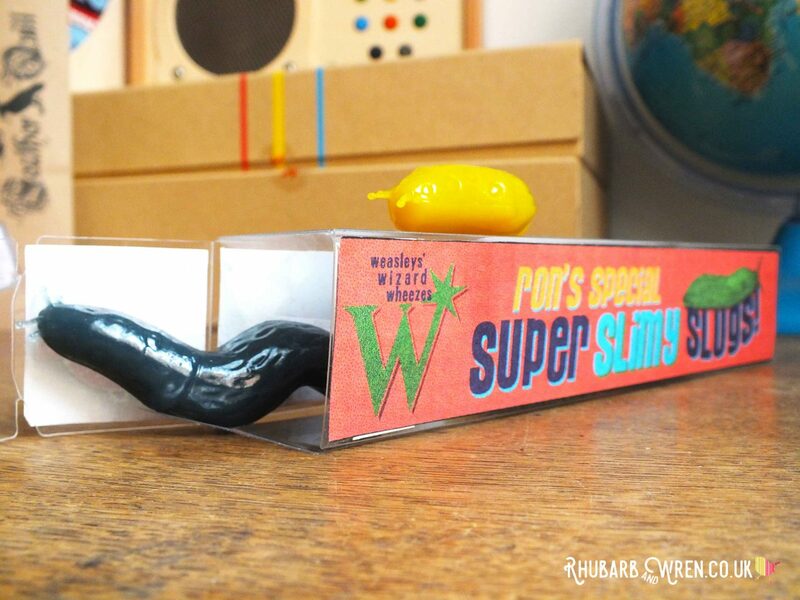 Ron Weasley’s slugs – super slimy indeed. 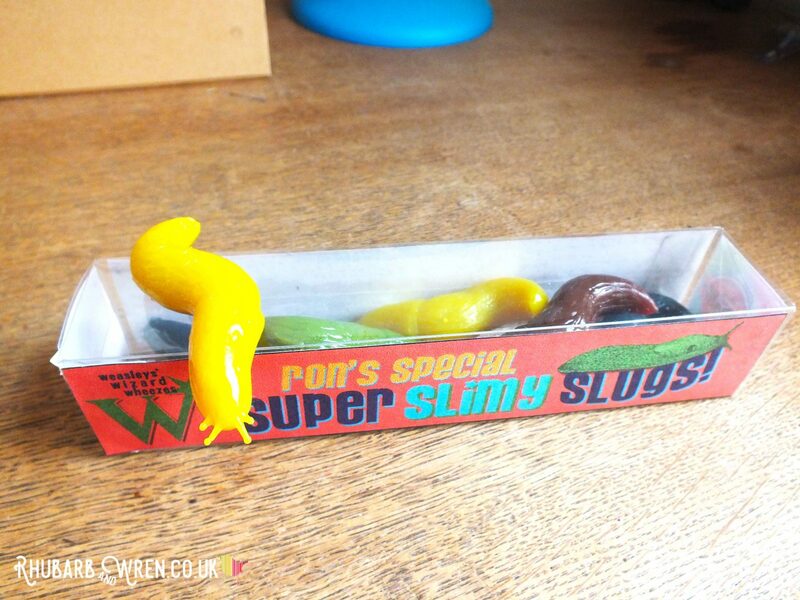 (affiliate link) Slimy Slugs – these are like the ones I used. Don’t bother hexing your enemies – leave a slug in their shoe instead! 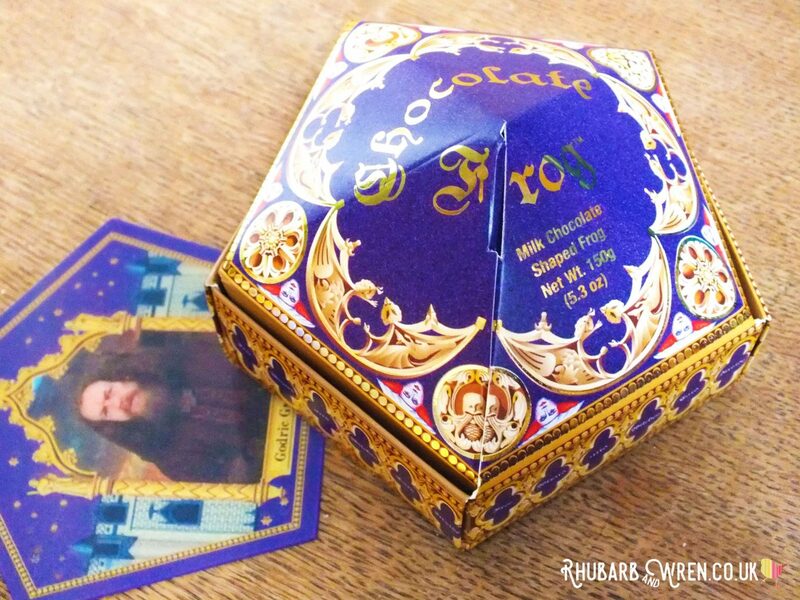 Chocolate Frogs with collectable cards! 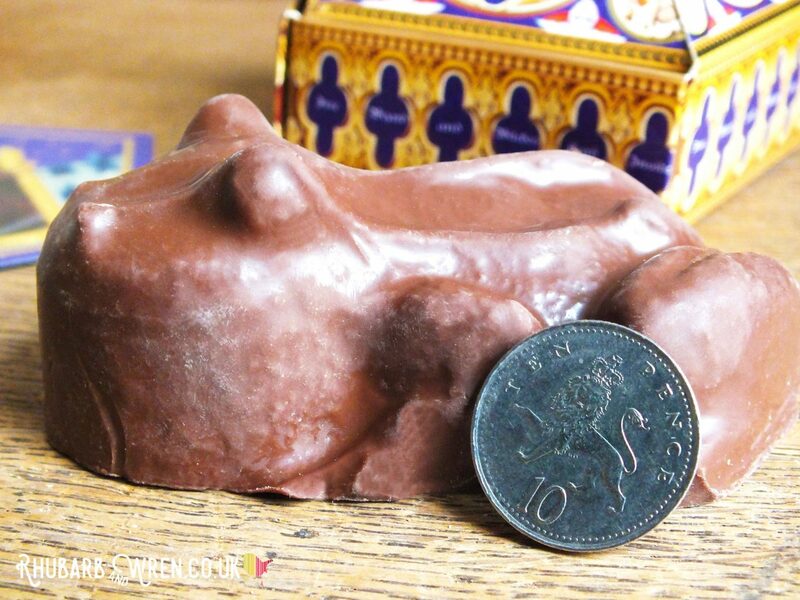 These chocolate frogs are BIG! G-Man’s face when he saw the chocolate frog was priceless (well, it cost £9). You get one ginormous frog (see size compared to the 10p!) inside the lovely box, along with a holographic collectable wizard card (we got Godric Gryffindor). There are plenty of great templates for the box online if you want to make your own – though the actual box has gold foil, and the cards are holographic, not things you can do at home. 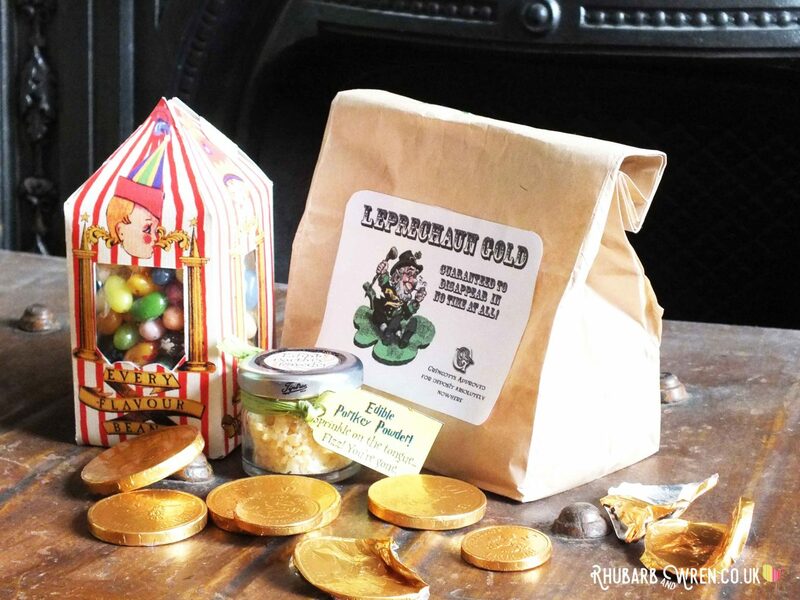 G’s friend chose to buy some Honeydukes milk bottle sweets instead, but the shop also had packets of jelly slugs (£4 – about the cheapest thing you could buy) and lots of other themed delectables – I was quite tempted by the peppermint toads and chocolate wands! Kids can pick up a free passport at the Harry Potter studio tour. 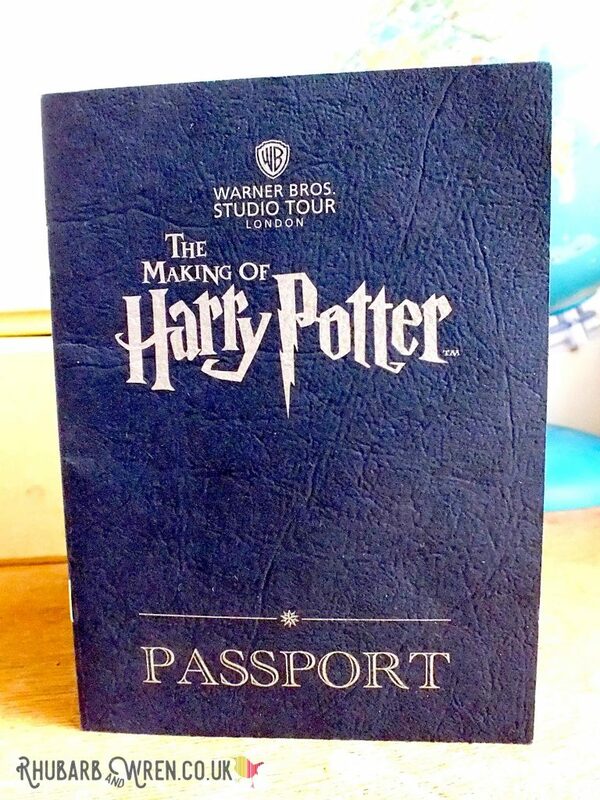 Now this Harry Potter souvenir passport wasn’t a purchase – it was actually free!! Make sure you pick one of these up for the kids when you arrive (the guides were giving them out in the lobby, but I think the information desk also has them). As you go around the tour, you’ll find various stamping stations. As it’s an embossing stamp, it may be hard to see, but in the picture below is an example of one of the stamps. This passport also has clues on the whereabouts of a number of golden snitches for the kids to find. It’s a lovely souvenir, and made my parsimonious heart warm a little more towards Warner Bros.
There’s hints to help find Golden Snitches hidden around the tour too. Look for stamp stations throughout the tour! As I’ve described in my tips for the tour, we decided to buy lunch in the cafe – we were lugging around all our coats so didn’t want more to carry (though there is a picnic area and I think​ you can eat your own food in the cafe). 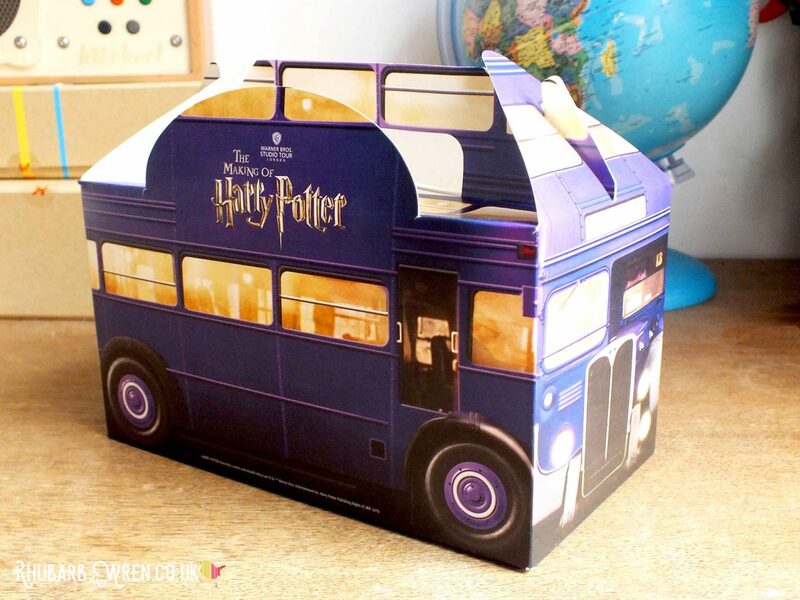 I was pleasantly surprised that the cafe prices and food weren’t too bad, and the kids’ sandwich meals (around a fiver) came inside this truly awesome Knight Bus box. Getting your lunch in a Knight Bus box makes the Harry Potter Studio Tour UK seem even more special. 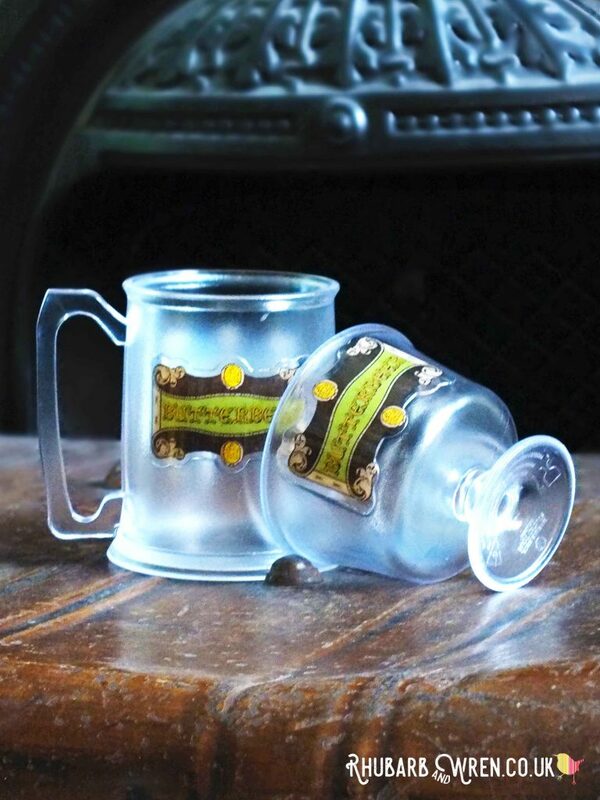 Along with the sandwich box, the boys also acquired these Butterbeer steins and sundae cups in the tour cafe. I personally would have skipped these, but they begged! The Butterbeer (or cream soda and squirty UHT cream) was OK – though the grown-ups ended up having to finish it. The ice-cream was a tasty butterscotch flavour whippy-type that the boys loved. It did add some fun to the lunch, though the £6.95 a portion (for each beer or ice-cream) was harder to swallow. If I could do over, I’d save a few quid per child by getting them ice-cream cones instead of the souvenir sundae cups, and just gotten them the steins. 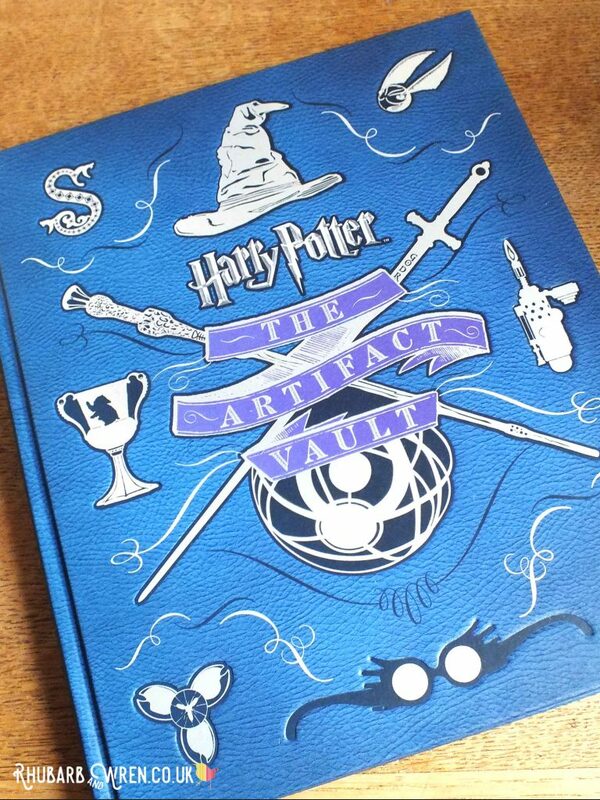 Lastly, I’ve included this book – The Harry Potter Artifact Vault – in the list because we gave this to G-Man as a birthday present at the beginning of the day (we took it with us to keep the kids occupied in any waiting around time), and the same series of books were for sale in the tour shop. They’re fantastic books and we would have picked up another in the series (G-Man was after the Creatures one too), but they were five pounds more than we paid on Amazon… I’ll leave it to you to decide if you think instant gratification is worth the extra money! A treasure-trove of information on artifacts from the world of Hogwarts and Harry Potter. So that’s it – their complete haul. Before the trip, they opened their Madam Malkin scarves, and G-Man got his book. Other than that, everything else they got either at the tour cafe/shop or, in the case of the Harry Potter party bag stuff, when we got home. It was a great way to round of the trip, since the boys had seen the bags (but not the contents) before we left, and had the anticipation of finding out what was inside to help carry them through the tiredness on the way back. 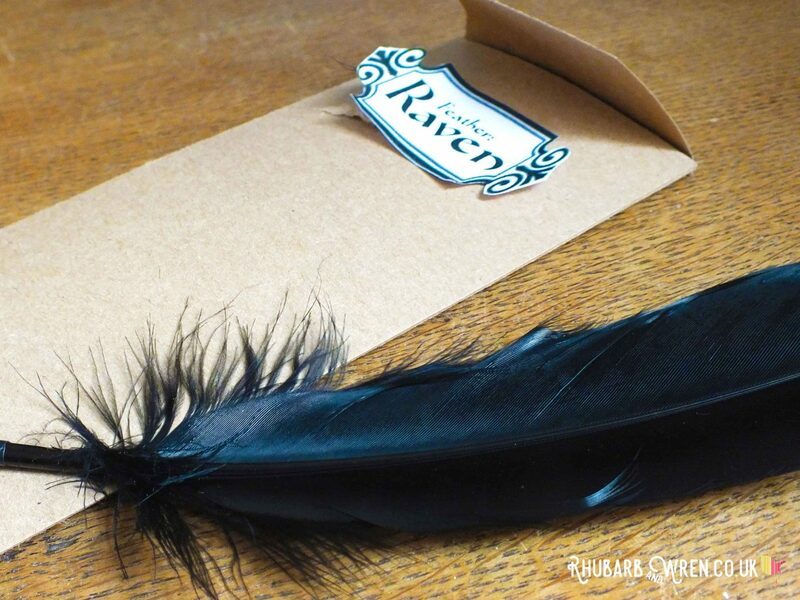 DIY your own Harry Potter goodies for a trip to the Warner Bros. Studio Tour. I would highly recommend visiting the Harry Potter Studio Tour, but only if your kids are old enough to enjoy a long day looking at exhibits (it’s not a theme park and there’s limited interactive or play opportunities), and have also seen at least the first two or three films. I’ve put more suggestions and tips on my review of our visit, so do take a look if you’re planning to go. Check out these other blog entries for more film-related fun! Birthday, Craft, Harry Potter, Holidays, Party, Party Time. Bookmark.